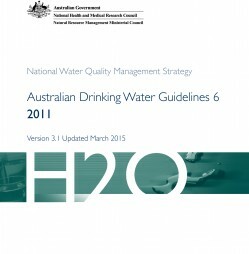 A recent update of the 2011 Australian Drinking Water Guidelines (ADWG) was made in March 2015. The ADWG has been developed by NHMRC in collaboration with the Natural Resource Management Ministerial Council (NRMMC). The ADWG is designed to provide an authoritative reference to the Australian community and the water supply industry on what defines safe, good quality water, how it can be achieved and how it can be assured. The guidelines have been developed after consideration of the best available scientific evidence and provide a framework for good management of drinking water supplies to ensure safety at point of use. They address both the health and aesthetic quality aspects of supplying good quality drinking water. When planning a stormwater harvesting project these Guidelines should be used in conjunction with the Australian Guidelines for Water Recycling (Phase 1 & 2).